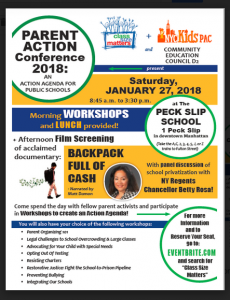 After a call to action by Bronx principal Jamaal Bowman, workshops will address topics including: Parent Organizing 101, Legal challenges to overcrowding and large classes, Advocating for your child with special needs, Opting out of testing, Integrating our schools, Preventing bullying, Fighting charter expansion, and Promoting Restorative Justice to end the School to Prison Pipeline. In the afternoon, we will show the acclaimed documentary on school privatization, “Backpack Full of Cash” narrated by Matt Damon. After the film, there will be a panel discussion with special guest NY Board of Regents Chancellor Betty Rosa. During the course of the day and at lunch, we plan to ask parents what sort of person they would like to see appointed to be our next Chancellor, and if parents should be involved in the process.